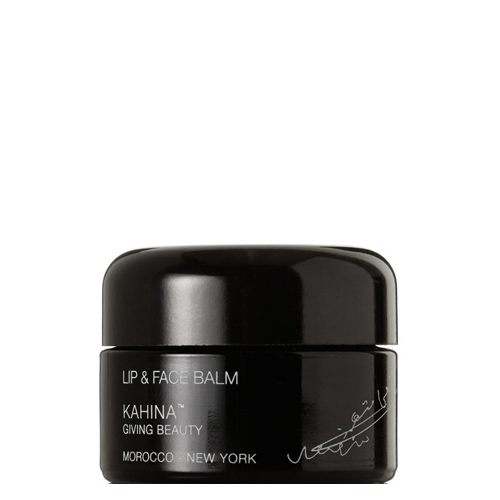 Provide a soothing, moisturizing, and healing feel to dry chapped lips and skin with the sophisticated Lip + Face Balm by Kahina Giving Beauty. Made with calendula to lend a calming feel, carrot seed oil and sea buckthorn make skin feel supple and healthy. This balm glides on lips for a sense of lasting protection and hydration. An infusion of blue tansy helps to quell feelings of inflammation. While we love this balm for how it feels on the lips, it also improves the look and feel of eczema and psoriasis. May also be used on the temples to lessen sensations of headaches and tension, on cuticles, fingers, and toes for a skin softening effect, and to diminish signs of inflammation around the nose during dry winter months. There are so many uses for this little jar of happiness, we've just started discovering all of them. Apply a thin layer to lips as needed, under lipstick or at night for a lip plumping effect. Massage a dab on temples to relieve feelings of headaches and tension. Apply anywhere skin is dry or cracked for an on-contact soothing sensation. For extra dry skin during winter months or after sun exposure apply over face serum to make skin feel soothed and hydrated. Keep a jar on your desk at work to reapply throughout the day. This product is great for men as a lip, face and cuticle balm.